Looking for answers, I shared Anna’s words with some colleagues, but I got no love there either. “Are you sure she is speaking about students and not teachers?” one asked. “Wow. This is exactly how I feel as a teacher,” another told me. It’s one of the ironies of our profession, I suppose. Educators continually find themselves confronted with mounting contradictions, particularly if they teach in oppressive school cultures. 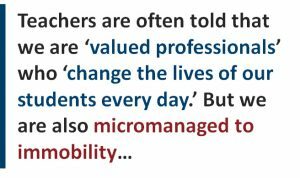 For example, we are often told that we are “valued professionals” who “change the lives of our students every day.” But we are also micromanaged to immobility, not trusted to make the simplest decisions that affect students’ learning and well-being. When students have to work in classrooms in silence because the teacher knows that the loud and messy learning is often seen as ill-managed instruction, the walls close in. That is the box in which many teachers teach and students frequently are expected to excel. Here’s another irony that plagues us. Choose any school’s mission statement randomly, and it is likely to contain some language about valuing diversity. Yet, students often report that they do not feel their individuality is respected. 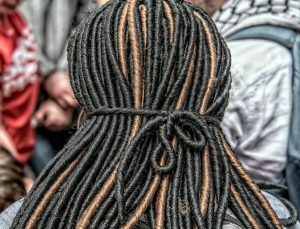 They point to recent news reports of students who are suspended for having unconventional hairstyles and untraditional hair colors. 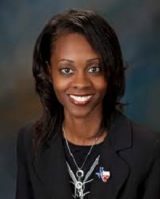 When school officials require teachers to regulate every element of student diversity, students are bound to feel a disdain toward school. The real irony is that what is said to support teachers is often belied by administrators and policymakers who are unable to walk their talk. On their lips, the word “professional” often feels not only empty, but like a word laced in condescension and mistrust. The differences between what we tell teachers and students we value and what we show them we value in fact squashes individuality and extinguishes the love of learning. Photo credit from Creative Commons through Flickr.